In our body, there are more than 600 muscles in the body, which together account for about 40 percent of a person's weight. Muscles of the lower extremity. 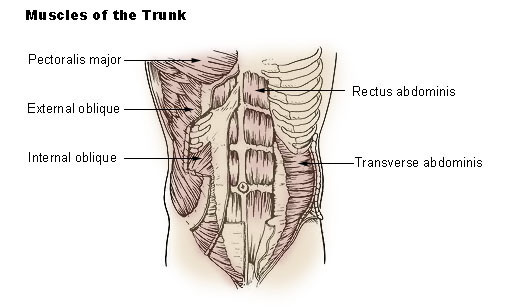 In our body, the Trunk Muscles (Muscles of the Trunk) include those that move the vertebral column, the muscles that form the thoracic and abdominal wall, and those that cover the pelvic outlet. In our body's face, we have well-developed muscles that permit a large variety of facial expressions, such as to show surprise, disgust, anger, fear, and other emotions, as an important means of nonverbal communication. In our body's face, the muscles of facial expression include frontalis, orbicularis oris, laris oculi, buccinator, and zygomaticus. The four pairs of masticatory muscles (muscles of mastication) are responsible for chewing movements (mastication), all connecting to the mandible and are some of the strongest muscles in the body such as the temporalis and masseter. There are numerous muscles associated with the throat, the hyoid bone and the vertebral column, such as the superficial neck muscles sternocleidomastoid and trapezius. In our body's muscular system of the thorax region, in the torso, the Intercostal Muscles are several groups of muscles, that as respiratory muscles are involved in the mechanical aspect of breathing, that run between the ribs, arising from the lower border of one rib and insert into the upper border of the adjoining rib, that contract during inspiration or respiration. In our body, there are three principal layers Intercostal Muscles: External Intercostals Muscles, Innermost Intercostals Muscles, and the Internal Intercostals Muscles. The external intercostal have fibres that go forward and downward (obliquely downward and forward from rib to rib). These fibers are called the antero-inferior, and are sometimes referred to as the front pocket muscle since the fibers mimic the direction a hand would enter a front pocket. The external intercostals assist in deep inspiration by increasing the anterioposterior diameter of the chest. The internal intercostal also have fibers, which go backward and downward (obliquely downward and posteriorly from rib to rib). These are called the postero-superior, or the back pocket muscles. The internal intercostals assist in expiration by pulling the ribcage down. The last layer is the innermost intercostals and consists of three separate parts; the subcostal (posteriorly), the innermost intercostal (laterally, which often causes confusion with the innermost intercostal referring to all twenty groups) and the transversus thoracis (anteriorly). The antero-inferior fibers have the effect of lifting up the ribs during contraction. Anteriorly, the external intercostal muscles do not directly attach to the sternum, but are replaced by the anterior intercostal membrane. The innermost intercostal muscles are also "back pocket" muscles. The internal and innermost intercostals have the opposite effect of the external intercostals and aid in forced expiration. The internal intercostal is replaced by the posterior intercostal membrane posteriorly.